Fusion of Flavours There are 7 products to choose from. Takeaway Lanzarote - Restaurants Puerto del Carmen Papardella Pasta with Chicken, Herbs and Masala Sauce. Best Italian Restaurants Puerto del Carmen - Lanzarote -Takeaway Puerto del Carmen, Lanzarote, food delivery with a variety of restaurant from Puerto del Carmen offering Pizza, Kebabs, Chinese, Indian,Thai, Italian, Canaries, Spanish and much more. Takeaway Lanzarote - Restaurants Puerto del Carmen Spaghetti Keema Bolognese - Bolognese Style with Indian Minced Lamb. 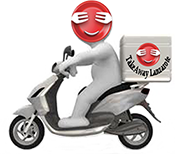 Takeaway Puerto del Carmen, Lanzarote, food delivery with a variety of restaurant from Puerto del Carmen offering Pizza, Kebabs, Chinese, Indian,Thai, Italian, Canaries, Spanish and much more.